In most cases, I would not have even picked this book from the shelf at the library, but after reading the cover several times over several weeks, I finally brought Radio Free Vermont by Bill McKibben home with me. I read it in one evening when I just wanted to read. Once I started it, it stuck to me like maple syrup and wouldn’t let go. Not to say it was my favorite book, but it definitely had an intriguing and unique premise. Vermont has had enough with the rest of the country impinging upon their freedoms and isolated way of life. In response, a group of citizens from Vermont have decided that the state should secede from the rest of the United States and become their own republic. Led by former radio personality, Vern Barclay, the movement uses a guerilla radio program to get their words out to the people. The Free Vermont movement stages a series of tactical events to endear themselves to the people of Vermont. They hijack a nationally brewed beer truck and replace the cargo with something from the local breweries of the Green Mountain State. Ethan Allen Day is a dismissable day from school in their eyes. This was a fun and witty book to read. This book tackles the ever-growing issue of secession from the rest of the United States with a unique approach. Rather than attempt to legislate the issue by putting it to referendum, the guerrilla group reminds Vermont why it’s great to be from Vermont. They point out how intervention from across the state lines has caused most of the problems from the rest of the country have adversely affected them. The characters in this book are jovial and fun to read. While they are not written to be deep, they did a very apt job conveying the message that McKibben was delivering. In very black and white terms, it came down to small and local being better than any of the evil empires that seem to control more than just the economy. Ironically, after decrying governmental monies coming into the state for Big Box projects, one of the characters is only too gleeful to take a huge chunk of that governmental cash to rebuild her old house after it was destroyed by governmental forces. Of course, she’s very happy to make her simple, Vermont home just a little bit better. This book is very timely with the dissent among the various political sects in this country right now. California is the lead example with both secession and partition. Historically, Vermont could be recognized as its own sovereign state 1771-1791, and had to pay off New York State for the right to become a state. Even back in 2004, people in Killington wanted to leave Vermont and join New Hampshire. McKibben’s book is an almost farcical look at the political divide in the United States. The ever-growing divide seems less and less likely to be overcome as each of the vocal wings in this country move farther left and right. With the gaping chasm in between, there seems to be no room for compromise. So, McKibben’s characters put it upon themselves to remind us all that sometimes the Davids can take down the Goliaths. 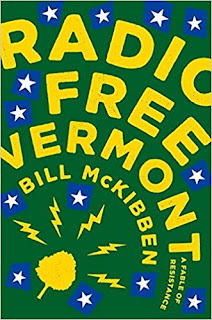 Radio Free Vermont by Bill McKibben gives us a quick look at the lengths people will go to preserve their way of life. Without being overtly combative, the Free Vermont group ultimately gets their way in a series of implausible events. While it is unlikely that any of the attempts in the book would ever actually be successful, it does remind us that even one voice can foment even a minor change. Enough voices and enough tweaks, and eventually there could be the change we need. It won’t come at once, but in a series of tip-toeing steps, anything is possible. Craig Bacon sometimes thinks we should cut New York City off at the bridges and set them adrift as their own state of Chaos. In the meantime, he wants to remind everyone that the Buffalo Bills are New York’s only NFL team despite what those pretenders in East Rutherford have printed on their helmets.